At some point in the history of cinema, an editor realized that movies did not have to be in chronological order. If one simply switches scenes around, one can be God and take control of time. Suddenly, linear storytelling was replaced with the capability to move about freely and change the flow of the story. There are many class examples of this technique being used over the years, and for modern audiences, the films which best typify this approach are things like Pulp Fiction or Memento. But, here's a hint, working with time can't make a movie special. This is a lesson which I'm aiming at Secret in Their Eyes. Secret in Their Eyes opens in present day 2015, as private detective Ray (Chiwetel Ejiofor) approaches District Attorney Claire (Nicole Kidman) with new evidence in a cold case which he had worked with Jess (Julia Roberts). The story then moves back to 2002, where we see that a Homeland Security team, which was watching a mosque in Los Angeles, discovered the body of a young woman in a dumpster near the mosque -- A young woman who just happened to be Jess' daughter. The identity of the victim made the case very personal for Ray, although his superiors and colleagues told him to focus on the mosque. Undeterred, Ray singles out a suspect and begins to pursue the man, not knowing that this will take over a decade of his life. There are those who don't like movies which play with time, such as the one's listed above (Have you ever discussed John Travolta's character from Pulp Fiction with someone who wasn't really paying attention? What a treat! ), because they find them difficult to follow. I do not typically have this problem, but I did with Secret in Their Eyes, as the movie is a confused mess. The movie features two segments, one of which occurs in 2002 and the other of which happens in 2015. If told in a linear fashion, the movie may (and that's a big may) have worked. But, Writer/Director Billy Ray has decided to shuffle things up and it simply creates unnecessary chaos. First of all, as the film opens with Ray's revelations, once the story goes back in time, we automatically know that the killer isn't caught. Spoiler alert! The biggest problem comes from the fact that the movie switches back and forth between the two periods showing the same characters investigating the same case, and all of these scenes look the same. I had to really pay attention to Ray's hair -- if it had flecks of gray, that meant that we were in 2015. The same thing went for Bumpy's (Dean Norris) leg -- if he was limping, then it was the present. So, we get parallel stories which are essentially tackling the same subject, and neither is very interesting. It also doesn't help that it's hard to tell which team everyone is on. Some are LAPD and some are federal and it's just another unneeded distraction. As the mother of two daughters, my wife was hesitant to watch the film, for fear that it would be too emotional. That concern was quickly swept aside, as Secret in Their Eyes is a very cold and distant movie. Save for the seen in which Jess see her daughter lying in the dumpster (we don't really see the body), the film feels as if it's populated by automatons. Characters say and do things which should be rife with feelings of anger or grief, but nothing comes through, especially from Kidman. She's played icy in movies before, but here it's like she's merely watching the movie along with us and is not actually a participant. 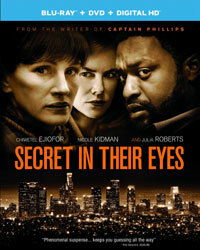 Secret in Their Eyes is remake of El Secreto de sus Ojos, which won the Academy Award for Best Foreign Language film in 2009. I have not seen that movie and judging by the synopsis I read, a lot was changed for the remake. I'm fairly certain that Secret in Their Eyes won't be winning any awards, not even for Julia Roberts who did the "no makeup I want an Oscar" thing. That effort, as heroic as some may find it, was fruitless given the jumbled mess of a movie for which it was attempted. Secret in Their Eyes offers baseball as a turning point in the case in a scene which will bypass most viewers on Blu-ray Disc courtesy of Universal Studios Home Entertainment. The film has been letterboxed at 2.35:1 and the Disc contains an AVC 1080p HD transfer which runs at an average of 30 Mbps. The image is sharp and clear, showing no noteworthy grain and no defects from the source material. Ray has given the film a very dark look, but the clarity of the image means that the action is always visible. The colors look fine, although we don't get many bold tones. The level of detail is notable, as we can see every line on Roberts' face and the depth works well. The Disc carries a DTS-HD Master Audio 5.1 track which runs at 48 kHz and an average of 3.5 Mbps. The track provides clear dialogue and sound effects. The track vacillates from active to quiet, depending on the mood of the scene. We get the most action during the baseball game sequence, as the roar of the crowd fills the rear speakers and offers some nicely defined stereo effects as well. The Secret in Their Eyes Blu-ray Disc contains only three extra features. We begin with an AUDIO COMMENTARY from Director/Screenwriter Billy Ray and Producer Mark Johnson. "Adapting the Story for Today's World" (2 minutes) is a quick EPK in which the story is explored by Ray and the fact that this is a remake is discussed. "Julia Roberts Discusses Her Most Challenging Role" (3 minutes) is a brief interview with the actress, who talks about her role and the goal of playing a grieving mother, while Ray compliments her performance.